I owe this shot to my friend Kelly, if it weren’t for his scouting eye I would have walked past this scene, leaving it unnoticed, as I answered an incoming call during our photowalk today. Thats the beauty of enjoying the company of friends during the days photographic adventures, you always have a backup set of eyes 🙂 Thanks Man! Awesome photo. As a child I sure was surprised to find out what the shoes-over-the-wire meant! Thanks Charles! I doubt the average pair of dangling tennies holds the same meaning as they supposedly once did, but I agree the explanation came as a shock to me as a child as well. Fascinating shot. Here in Asia, we don’t have such practices, not that I know of at least. 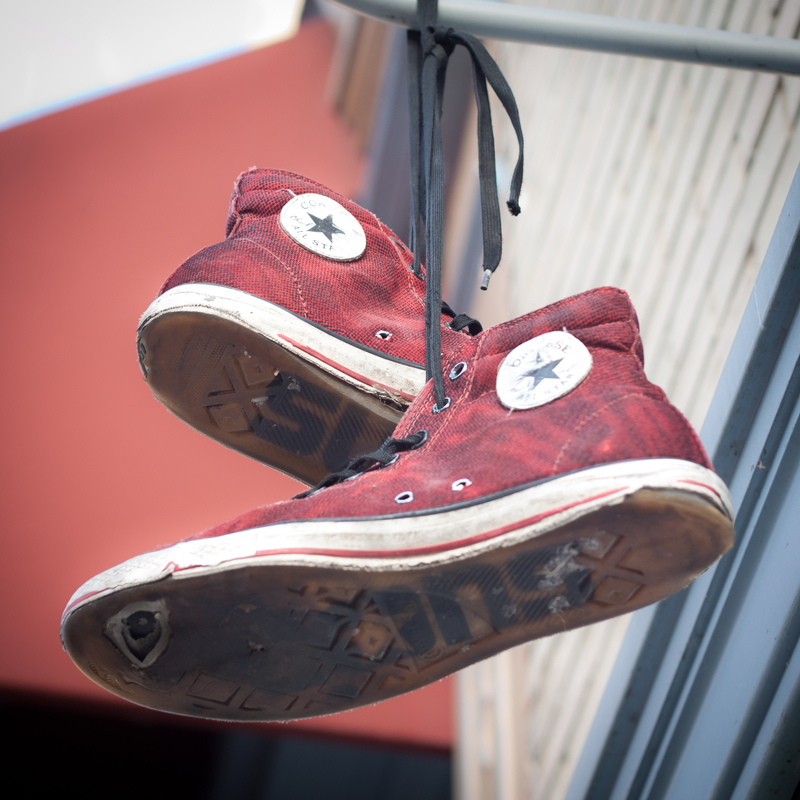 It was interesting to read up about “shoe tossing” on Wikipedia. Stunning shot! That is how I feel! LOL! It’s all about finding the smallest detail in the vast canvas of the world. Good work for your friend Kelly! Do you know what that means today? I do. It means there is a drug dealer nearby. Good for Kelly for noticing! Great shot, by the way. I like the symmetry of the shot, the confluence of the lines, and the harmony of the colors. The shoes are well worn and probably well loved. I imagine the kid shooting baskets while wearing his Converse shoes. I’m curious about the “SUNS” lettering on the soles. Is he a Phoenix Suns fan or do the shoes come that way? In our day of massive consumption and materialism, it’s comforting to see that someone wore shoes until they wore a hole under the soles. Did the owner toss these in celebration of getting enough cash together to buy an expensive pair of J’s? Or is the owner no longer? You see? You’ve taken a shot that can tell a story. Wow. I agree with your comment to Mona. But maybe she, like my soon-to-be-wife, just over thinks everything. Whatever the case, I like to take my fiance along whenever I go on a photowalk or photodrive because she’s got some set of eyes. OK, and other body parts. But I often ask her to take up a camera and shoot what she sees. She still refuses, for some reason. Anyway, love the shot and the holes. Never knew what shoe tossing meant till now. See what you learn? Hey Paul! I wouldn’t say she over thinks things at all, thats whats truly magnificent about photography, it speaks to each of us in a different way. While one may see a short and sweet story, the next may see a more complex version with a multitude of layers. Neither is wrong, in fact both are correct which adds to the magic of the whole thing. I can relate as well I have tried to get the camera in the hands of many, but am still met with some resistance on a few friends, however more and more have been embracing the art and joining me on my creative adventure 🙂 Thanks again Paul! Again, I agree. Maybe “over thinks” sounded too harsh. I tend to see things more on a surface level. When we go to a movie or read the same book, I’m constantly amazed at our discussions afterwards and how she gets so much more out of it. I think some people tend to get more totally involved in a story, a movie, a work of art. I wish I could. Well worn, hangin about. Expert capture of an everyday scene. Hey thanks again for such kind words David 🙂 I absolutely love your recent bike pic! !